A giraffe is one of Mother Nature's beautiful quirks. They are graceful, yet clumsy at the same time. Humans are fascinated with how the giraffe manages to coordinate their awkward legs and long neck to move with such grace and elegance. The Giraffe is capable of adapting to its environment and can make use of relatively scarce resources. They sleep for only a few hours per day and can feast on the almost inedible acacia tree. Many local tribes view the Giraffe as an intuitive animal because of its long neck and perfect vision. In a sense, they are able to see danger long before others around them have any inkling about what's to come. Giraffes are most vulnerable when they bend to take a drink of water, as such, they tend to be very alert and aware of their environment. This point hasn't been lost on local tribes and the Giraffe is a poignant reminder of the importance of paying attention to your surroundings. The Bushmen of Africa have developed numerous rituals that highlight their views on these strange but beautiful animals. The Giraffe Dance is meant to cast aside evil spirits that affect one's head. These animals have been incorporated into a plethora of African folklore traditions, which speak about the Giraffe's intelligence and account for its unbelievably long neck. During the height of the Roman Empire, countless giraffes were shipped to coliseums in Europe for public viewing. The Romans were fascinated by these unusual animals and believed that they were a hybrid of leopards and camels. Unfortunately, this practice quickly died out after the fall of the Roman Empire and by the Middle Ages, Europeans only heard rumours of the existence of these strange creatures. The only other locale outside of Africa where giraffes could be found was in China. From as early at the 1400s, giraffes were shipped to China for public display. They later helped to spawn the legend of the Qilin. Today, the giraffe enjoys the status of a noble animal in many modern works of art. The impressionist Dali often incorporated these creatures into his pieces, along with elephants and other jungle animals. Even NASA is taking a few lessons by designing suits for astronauts and fighter pilots that are able to minimize the effects of high G forces on the brain. Their inspiration? That quirky wonder of Mother Nature known as the Giraffe. 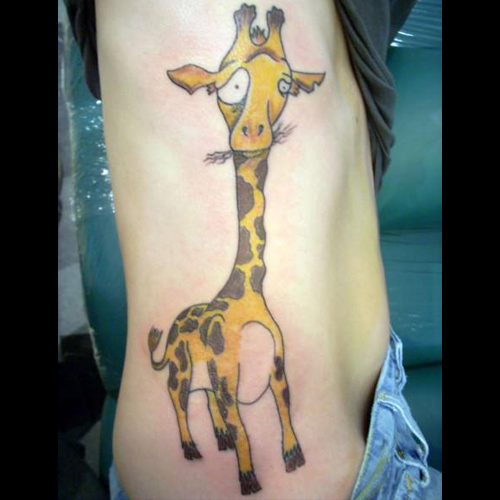 Giraffe Tattoos are rare treats since not many persons readily identify with the animal and this is a rather awkward tattoo design. Those opting to have a Giraffe Tattoos tend to make their pieces comical by incorporating cartoon elements into the artwork, like a sitting giraffe reading a newspaper or a group of animals gathering for a cup of tea. Regardless of which design elements you chose to incorporate into your piece, the most important question to ask yourself is what does your new tat symbolize. Where will it be placed on your body? Will you combine it with other elements or let it remain alone? If you need some inspiration, then our team can design a truly unique piece for your tastes. Visit us at www.itattoodesigns.com and take advantage of our Custom Service.